Surviving in hot weather and cold weather are two completely different processes. The bottom line is that vans have a lot of space and material constraints that make them less able to handle the temperature extremes that houses can. Insulating your van for handling cold weather in many ways makes it less comfortable in the heat. When it comes to preventing heat inside a vehicle, it is helpful to understand the three types of heat transfer and how they relate. In a van, direct sunlight radiation through windows will warm up the car more quickly than any other process. Reducing this will drastically reduce how quickly your van heats up. Infrared rays from the sun (radiant heat) pass through the windows, and can be reflected right back out. Shiny materials like aluminum, Reflectix, or Infrastop, like a mirror, will reflect the heat. Reflective windshield covers can be bought online and will make a big difference in the amount of heat that enters the vehicle. For smaller side windows, a roll of Reflectix, or Infrastop can be cut to size and placed over the window when parked. Custom window covers can be created by using Reflectix on one side, carpeting or cloth on the other, and a little bit of insulation batting in-between. This design allows for the shiny side to be facing out in the summer, and the reverse effect during the winter (reflecting interior heat back in). Window covers can be held up using Velcro, snaps, buttons, ties or simple press-fit. This is disappointingly easy. For hot weather, in most cases you don’t want to have an insulated van. There is a bit of misinformation perpetuated around the ‘net here. And lots of unnecessarily complex air gaps and layers of multiple materials trying to fight basic rules of thermodynamics. Insulation is like wrapping a sleeping bag around your van. If it’s hot out, the last thing you want is a sleeping bag that you can’t get out of. The function of standard insulation is to slow the transfer of heat. With insulation, the van takes longer reach the ambient temperature. If it’s 90° outside, and your van is 70°, it might take an hour two to reach the outside temperature. So while your van might be more comfortable at 10am, it’s still going to get hot by early afternoon. There’s no way around this other than adding significantly more insulation (6-12″ thick like in a house). Adding insulation in a van is just fighting for an hour or two of mid-day comfort. If it’s hot outside, then eventually it will be hot inside the van. The downside to this is that when it is more critical to have a cool van- for sleeping- it takes longer to cool down. If your van is 90° inside, then as the outside temp reaches 70°, it will take longer to cool down. This isn’t counting all of the heat sources in the van. Your body puts out heat. Your fridge, computer and power brick put out heat as well. If you’re cooking: heat. So you now have more heat in the van than outside, and it’s being trapped in by insulation. There’s also heat stored in the thermal mass of all the stuff in the van. If you have a jug of water that has heated up during the day, it’s going to be releasing that heat over the course of the night. These problems are all exasperated if you’re using solar power on the roof. Rooftop solar means that to charge your batteries you will need to park the van in the sun. This will make the van hotter than the ambient temperature, like a solar oven. If it’s 85° outside, it will be 95° inside the van parked in the sun. The insulation will reduce this effect a little, but not enough to make a difference. You might hear the argument that “the panels will shade the van”. Not true. They shade part of the van. Even if you have 1000W of solar panels covering the whole roof, other side/s will be soaking up all that glorious sun heat. Another thing to note is that solar panels trap a little of the heat that is radiating off the roof of your van if it’s hotter than the ambient temperature. So the “roof is shaded” helps a bit, but definitely not more than parking the whole van under the shade with no panels. It’s similar to the difference between you wearing a wide brimmed hat in the sun and you standing in the shade. Keep in mind that this doesn’t mean you shouldn’t insulate your van. With good ventilation, you can mitigate most of the effects of the heat buildup. It just means that insulation isn’t helping your van in the heat and should only be done if you are planning on lots of cold weather. What about radiant barriers (Reflectix) in the walls? Preface: this is based on some conjecture on my part, so take it with a grain of salt. But let me walk you through why I think using Reflectix in the walls is a losing battle. The ultimate purpose of this material is to reflect radiant heat outside to keep it from getting in. There are a few issues with this. On a practical note, Reflectix is hard to install because you need an air gap with minimal surfaces touching the reflective (hot) side. This means that you must essentially build a box within your van that’s not touching the hot outer walls. Any time you attach Reflectix to an outer wall, you are creating a thermal bridge and are you reducing the effectiveness of the barrier. You can use materials like foam that reduce this thermal bridging, but the effect is still there. This makes it hard to attach household things to the walls of your van. To get the rated R-value on HVAC installations, Reflectix is wrapped on top of a series plastic standoffs that are attached to the ductwork which, consequently, is time consuming and rarely done properly in household installs. The radiant heat you are blocking is coming from your van walls. The walls are heating from the sun and outside environment. Then they are radiating heat into the air gap between the van wall and the insulation. Then your Reflectix bounces that heat right back into the van walls. The radiant energy doesn’t magically just disappear once it’s been reflected. You now heating your van walls from both sides and heating up the air in between the two. Air doesn’t hold much heat, so the net gain of Reflectix is still positive, but not nearly as much as if that heat wasn’t trapped by the exterior van walls. Adding a radiant barrier is simultaneously adding a vapor barrier. Your van walls aren’t breathable and Reflectix isn’t either. Stacking these vapor barriers is bad practice because if moisture gets in between the two- which it inevitably will- it won’t get back out easily. It will be trapped in the warm air in between the barriers and you’ll develop a mold problem sooner than later. In summary, radiant barriers are minimally effective and take a ton of work with some downsides. Standard insulation will hold your body heat and the hot van interior in more, especially if it’s sitting in the sun. The most effective way to be comfortable at night in hot weather is to be able to dissipate the interior heat quicker which is counter to what insulation does. A surprisingly effective method of insulating your vehicle against the heat is by using proper floor insulation. Due to convection and radiation, hot air will transfer through the floor from the engine and exhaust during driving. This can also happen if you are parked above a hot surface like pavement. The main goal is to insulate the floor well against conduction. This uses the same techniques and materials as you would for walls in the cold, such as foam with a high R-value. For more info on materials check out this article. If you’re feeling ambitious and think you’ll be driving a lot, you can add heat shielding material on the floor of your van to reduce heat transfer from the exhaust and engine. More effectively, you can purchase heat shielding for your muffler and exhaust. Advanced tip: an inexpensive laser pointing thermometer can be purchased to determine which areas of your van are transferring the most heat in. This can help you determine which spots need more insulation, or which areas of the vehicle require the most focus. Appropriate airflow makes a big difference in the comfort of your van. To make airflow work at least two openings are recommended: one for air intake and one to pull air through. The further away you place these openings, the more airflow you will get throughout the vehicle. An example of poor airflow would be having a vent fan in the cab (above the driver seat) paired with opening the driver’s window. Air will flow between the two but you will not get fresh air in the back of the vehicle. If you have a vent fan in the cab area and open the back windows, you will get air moving through the majority of the van. To get the most airflow, consider opening different doors and windows throughout the day. Depending on where you reside, bugs may become a major factor in your ventilation flexibility. Options such as creating custom window screens or purchasing large bug nets for the side and back doors are necessary to stay comfortable. If you are concerned about installing a roof fan, smaller portable fans can be purchased that run off batteries, however they will not be as effective as a full roof fan. The roof of your van is going to absorb a lot of heat throughout the day. Placing white plywood or other reflective material above the roof will reduce the amount of heat that can get inside. If you park in one place for extended periods of time, consider hanging an awning or tarp above your vehicle as a semi-permeant fixture. Being able to park your vehicle in the shade will make a big difference in the amount of heat that reaches the van. Attaching an awning to the roof-rack or side of your vehicle will give you a shaded area to hang out in the heat. We installed an awning so we could sit outside in the rain, but have found it to be much more useful in hot weather. As van dwellers, we recommend following the weather for maximum comfort. If possible, head north during the summer, or to a higher altitude. Try to park in shade and face north if possible. This will give you the least amount of direct sunlight on your large windows. Spend the day somewhere cold like shopping malls, libraries or museums. Limit activities inside the van such as cooking. It may sound counter-intuitive, but on hot nights it is often more comfortable to sleep outside. We spend a lot of our time on campground or BLM land and keep sleeping bags and a small backpacking tent in the van. We’ve found thatsleeping in a tent is more comfortable than inside the van if we’re caught in a heat wave. You may be asking why no one has ever installed an air conditioner in their van. The truth is, people have. It is possible to install an air conditioner, but it is not practical unless you have a generator or shore power. An air conditioner takes an enormous amount of power to run. With solar power, you can run an air conditioner but it would need so many solar panels and batteries that it is not practical for most people. This van dweller was able to do it with 1000W of panels, 2000W inverter and 780 ah of battery. These things get pretty pricey and bulky, but for those building a sprinter it isn’t out of the picture. Swamp coolers work by evaporating water with a fan that creates a cool airflow. Because of the evaporation process they do not work in humid environments. Additionally, they require a decent amount of power to run the fan and a water source. DIY swamp coolers that you see online do not work adequately in small spaces because of how quickly the air gets saturated with moisture and the lack of effective evaporation surface they are usually built with. For these reasons, it is easier to employ the other cooling techniques found in this article. I think the Reflectix debate can be cleared up a little bit if people remember that radiant heat is also known as infrared light. I disagree with the claim an Ac can not be run cheaply in a van.i have sportsman 2200 invertor generator that powers a 5000btu window Ac I have installed in back window. I can park at night and have the inside of the van in low 70s 1 gallon of gas gets me almost 12 hours cold breeze at night without any insulation. During the day with reflection in Windows and parking in shade with no insulation I can get 6 or 7hrs of cold Ac. I use about a gallon and half a day if I don’t go out after work at the most if its 90or hotter. I have been living in my 2001e350 super duty passenger van for 3 weeks and the last 3 weeks has been in 90s . I am considering putting reflection on top of roof for even more reflective power. With a generator, all bets are off! I definitely agree with your point- if you are able to use a generator, then AC is very reasonable and relatively inexpensive. For various reasons, most van dwellers choose to shy away from a generator setup but are still looking for a way to run AC, which is what our article is focusing more on. This article confirmed things I was already thinking, but no other article I have read had spoken about. Thank you! Informative article. That is why if you are doing extended traveling or van living you should stay away from vans that have too many windows (like VW buses and conversion vans) unless you are planning on just being in mild weather. Glass is where you will gain and lose heat the quickest and not much you can do to insulate it. In most U.S. States it is illegal to paint glass windows in a vehicle (blocks light and view, would still pass heat anyway) so you are limited to maybe vinyl wrapping the exterior glass (the kind that has tiny holes and you can see out but not in). then you can add window tint on the inside to cut UV rays coming in. Then you would have to use curtains with reflective backing to try to reflect back the heat coming in. 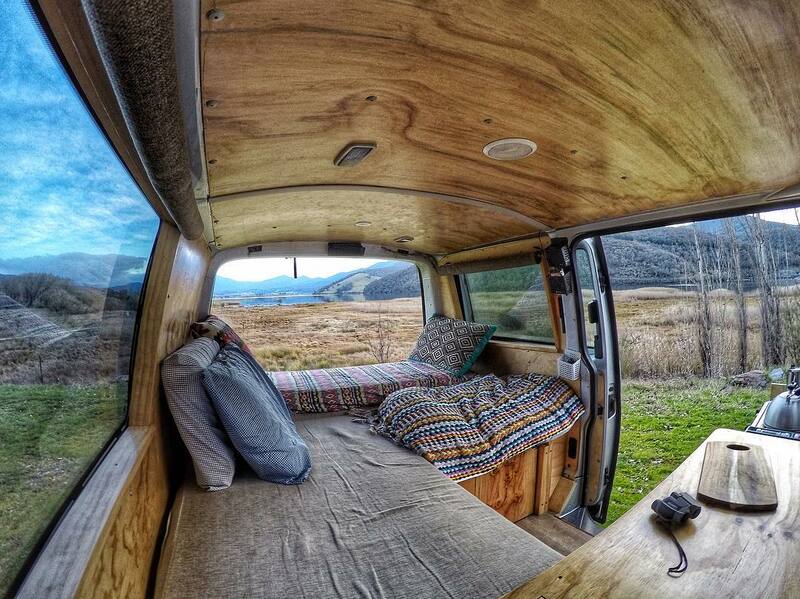 And then like some conversion vans, you could build your interior panels and partitions as desired and not match the window openings in the body (bad design in my opinion) and maybe add some insulation behind the glass but will never be as good as a properly insulated cargo van with roof vent. If you get a broken window would be a pain to replace as well since access would be limited. You can insulate well your cargo area to live in, but remember your driving area does not have that much insulation from the factory. You can use the mentioned window covers, and then a heavy curtain between the cab and the cargo section. Something I have tried and works if you are parked for a certain period, is an awning that overlaps part or entirely your roof, effectively becoming the first layer of protection to eliminate UV rays hitting your roof although takes time to set up and take down. Now if you have solar panels, you can’t cover those… If you will be in extreme weather like AZ in the summer (I know I live here) or Northern States in the winter you will definitely need mechanical systems like A/C and heating to cope. How to power and which type, that is what you have to decide. They do make what I call “portable carports” – a canopy/tent for vehicles. I think they’re used more in farmers’ markets and roadside stands, but would work well for vehicles – depending on height. 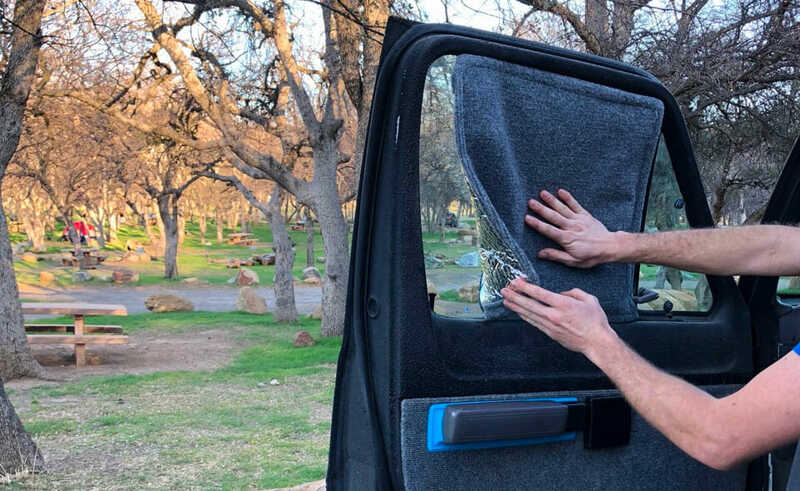 I would think it would work better than reflectix – which I think are more appropriate for the outside of the vehicle. Great info, but I do have one question – In cold climates, insulation will help you keep warm. In warm climates, not having insulation is your best bet to stay cool. So what do you do if you want to travel with the van in both climates? Good article addressing heat. My wife and I are trying to figure out what we want to do about insulating. Very interesting article. I have a question if you put the refectix on the inside of the interior panel ( which you remove to get to the inside metal of the van} would that stop the condensation and also act as insulation in the winter ? If you installed a diesel heater and left that on all night would that be a more effective way of staying warm on cold nights? For the Reflectix: You are certainly welcome to install Reflectix as a vapor barrier to try to prevent condensation. If the install is good, then it does seal against moisture. The issue with this is that in the real world, a complete vapor seal is tough to do in a vehicle. A vehicle has lots of holes and moving parts and is subject to abuse on the road. And if/when water does happen to get behind the Reflectix for whatever reason, it is now trapped on the wrong side of the vapor barrier. This can lead to even more problems with mold and such. We see many people try using Reflectix as a vapor barrier but few installs last for very long before they need to be pulled apart and repaired or dried out. 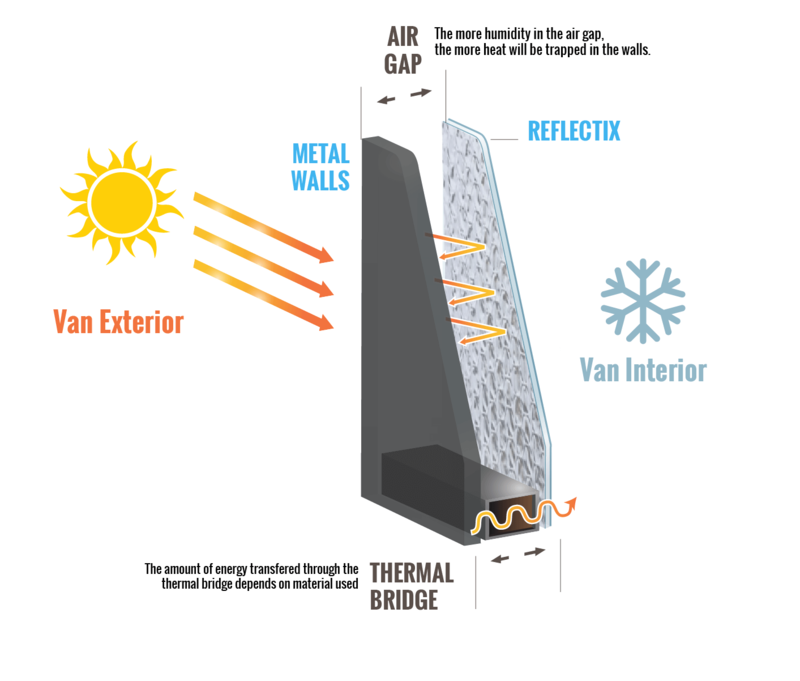 If there is an air gap between the Reflectix and the van interior, it does function as insulation in the winter. It only reflects back heat that is produced in the van, so it doesn’t help a whole lot without a heat source. Otherwise you’re trying to use your body to heat the entire inside of the van. Your body will do much better heating up a small space like a jacket or sleeping bag. We live in Greece and would like to use the van in the Summer where the temperature is around 95 degrees.But we also like to ski in the Winter in northern Europe where it is cold.Is it better to insulate the van or not? It’s easier to warm up than it is to cool down. Heavy insulation can cause problems in the summer where you can’t cool the van down enough to sleep. It’s also easier to manage moisture in varying climates as far as location of the vapor barrier. In the winter, you can accommodate with a heater and lots of blankets. Some people still prefer insulation, but for dealing with both climates, our base recommendation is to not insulate. Thank you very much for your reply Ian! So you’ve convinced me NOT to insulate (TX). My question is what do I do then about a vapor barrier – do I need one at all? Would my walls (possibly wood but also maybe ACP panels) go right up against the vans metal ribs with nothing behind it? Thanks for all your help! So are you saying that if you are going to primarily be in warm-weather locations, insulation shouldn’t be put into the van?